Stress a very collective term is being used by a number of researcher, clinical psychologists, and psychiatrists. It is a state of mental or emotional strain or tension resulting from adverse or demanding circumstances. It is extensively prevalent state in current human life, and is very hurtful to the human being that poses them towards problematic situations and development of some psychological and physiological disorders. It plays a key role in mental health as well as physical health issues if present in human beings. Innumerable researchers in India and abroad have conducted studies on stress in different areas. Due to many reasons, it is assumed that the stress is present in diamond workers. Psychological problems such as stress at workplace are common features due to the current working lifestyle, working environment, as well as host factors. In diamond cutting and polishing industry, diamond cutters often face a lot of work setting factors and behavioral complexities during their working life. Diamond cutting practices include changing the form of diamond from a rough stone into a faceted precious one. It needs specialized knowledge, tools, equipment, and techniques. In addition, it has extreme difficulties in accomplishing the task due to the constraint of cutting in different bizarre facets, shapes, and sizes, as well as complex properties and nature of diamonds under noisy and dusty atmosphere, which might pose invariable threats on psychological and behavioral health. Diamonds are precious gemstones. Larger and purer the diamond, the more precious it is. Smaller pieces of diamonds are used for cutting glass and drilling rocks. Only a diamond can cut another diamond. Diamond dust is used for polishing diamonds and precious stones. Carbonado and bort (gray and black variety of diamond) are used for making precision instruments, and diamond dies are used to make thin tungsten wires. As the diamond is hardest know substance in nature, its hardness makes very difficult to cut it in multifaceted gem materials. Its hardness varies with crystallographic orientation, such that it can only be polished in certain crystallographic directions. It is optically isotropic and has a very high refractive index that makes the work difficult in quite subtle differences of critical angles of total light reflection within the faceted diamond. The steps followed by diamond cutters include 1) selecting/sorting the diamond. This includes examining each diamond for its potential color grade, clarity grade, and cutting style. 2) Marking the rough for manufacturing. 3) Cleaving and/or sawing the rough crystal. 4) Bruting the girdle, and 5) Polishing the facets. Stepwise, there are five types of jobs of diamond cutting workers, i.e., talia tarasi – bottom work; ghat tarasi – Bruting; table – polishing or table work; mathala – top works and atphel. A few studies on diamond cutting and polishing industry and its workers have been carried out by Indian researchers. Mehta and Ribadiya studied the morbidity task and treatment pattern among the workers of diamond cutting and polishing industries in Ahmedabad; they reported that the majority of workers were between 15 and 34 years of age, and 5% were children. The vast majority were literate; most were secondary pass, the sample also included graduates and postgraduates. More than 35% had refractive problems. Later, Dave et al. studied HIV and STI prevalence and determinants among male migrant diamond cutting workers in Surat city. They conducted a multi-stage stratified probability sample survey of migrant (defined as not born in Surat city) men aged 18–49 years working in the diamond industries. The main study limitation was social desirability bias for self-reported sexual behavior; STIs were diagnosed in some self-reported virgins. HIV and STI prevalence were found lower than expected, but prevention interventions remain necessary in Surat since almost 40% of STIs among participants were probably recently acquired, and sentinel surveillance HIV prevalence remains high. Recently, Bharadva et al. also examined the prevalence of various forms of tobacco use and its factor among diamond cutting and polishing workers in Surat city. They conducted a cross-sectional study of 295 diamond cutting and polishing workers and interviewed with predesigned and pretested questionnaire, and found that approximately 71.2% workers had a history of tobacco use in different forms. The mean age of starting tobacco was 21.44 ± 6.35 among users. Mawa-masala (79.6%), khainee (22.39%), and gutkha (4.48%) were preferred forms of smokeless tobacco among all-users. Most common reason for tobacco initiation was peer pressure (74.13%), followed by psychological stress (47.76%). The authors concluded that the prevalence of tobacco use among diamond workers was very high compared to general population. Earlier Gheysens et al. studied cobalt-induced bronchial asthma in diamond industry workers, and found three diamond workers with occupational asthma. The available data on diamond industry workers indicated that most studies focused on their physical health problems, particular disease, habitual, and behavior patterns. However, none of them concentrated on various psychopathic warnings and psychosomatic problems due to the work environment, nature of work, and income issues. To examine the relationship, if any, between job task and level of stress among diamond workers. 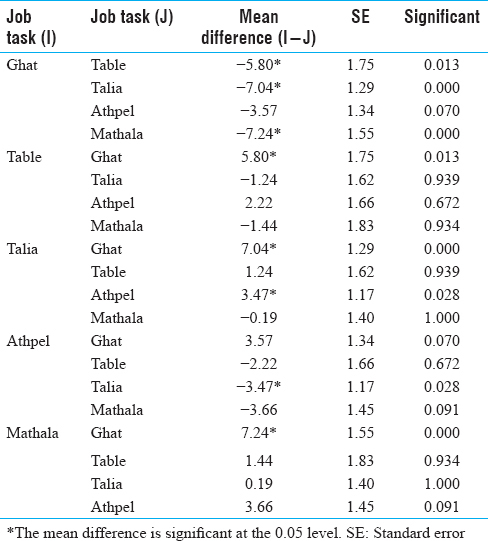 Independent variables: Job task (ghat tarasi, table, talia bottom, athpel, and mathala). A total of 342 diamond workers were enrolled from different diamond cutting and polishing factories in Ahmedabad, Gujarat (age range, 18–60 years) belonging to five different types of job tasks, i.e., ghat tarasi (N = 37; mean age = 28.84 years), table cutting (N = 35; mean age = 39.43 years), talia bottom (N = 123; mean age = 34.94), athpel (N = 78; mean age = 35.32 years), and mathala (N = 69; mean age = 35.68 years) using convenience sampling technique. The depression anxiety stress scale (DASS) was used to assess the stress of diamond workers. DASS is a set of three self-reported subscales designed to measure the depression, anxiety, and stress of male and female population ranging between 17 and 69 years of age. The sum of the relevant 14 items for each subscale constitute the participants' scores for each of depression, anxiety, and stress, including items such as “I couldn't seem to experience any positive feeling at all,” “I was aware of the dryness of my mouth,” and “I found it hard to wind down” in the respective order of the scales. The order of the 42 items were randomized so that items of the same scale were not clustered together. Each of the scales was then broken down into subscales comprising two to five items each. The stress scale's subscales highlight the levels of nonchronic arousal through difficulty in relaxing, nervous arousal, and being easily upset/agitated, irritable/over-reactive, and impatient. DASS is a valid and reliable assessment tool. Factor loading of the scale ranged from 0.39 to 0.88. Reliability (Cronbach alpha) of the entire scale was 0.89. Test–retest and split-half reliability coefficient scores were 0.99 and 0.96, respectively. Following norms Table [Table 1] has been adopted to interpret the obtained scores on DASS (2003). The obtained raw scores on DASS with respect to the job task of diamond workers are statistically analyzed with the objective of clarifying and explaining the objectives. Mean values were calculated for the graphical presentation of the data related to different levels/types of dependent variables. One-way analysis of variance (ANOVA) was used to understand the effect of different job tasks on the psychological problems, i.e., stress among diamond workers. Results showed that the diamond workers have mild level of stress (M = 15.41; SD = 8.7), irrespective of their job task. 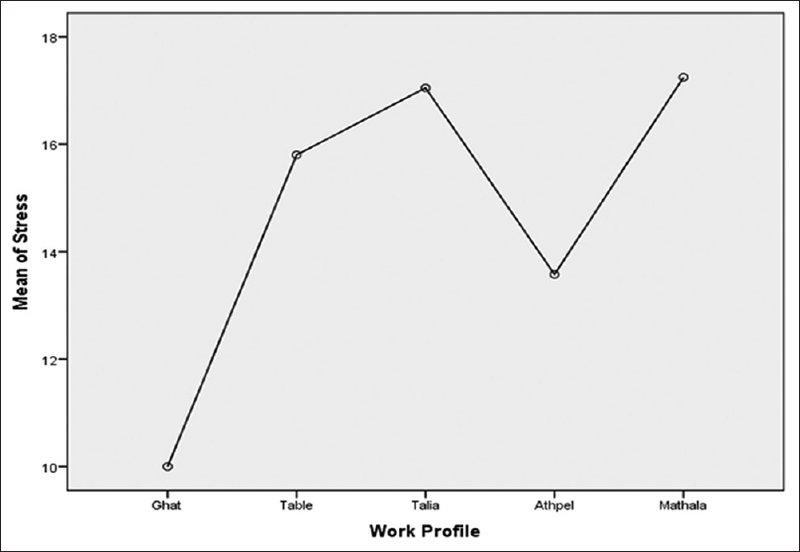 The comprehensive description of data on diamond workers belonging to different job tasks, i.e., ghat tarasi, table cutting, talia bottom, athpel, and mathala in relation to stress is depicted below. 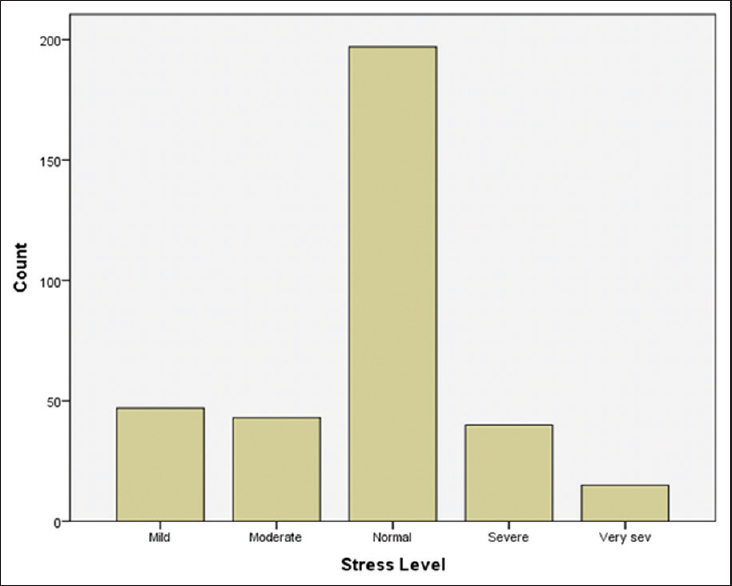 Out of the 342 diamond workers, several diamond workers were found to be normal (N = 197), mild (N = 47), moderate (N = 43), severe (N = 40), and very severe (N = 15) level of stress, as shown in [Figure 1]. As shown in [Figure 2], mathala was found to be most stressed group (M = 17.25; SD = 9.65) indicating higher stress among diamond workers, followed by talia (M = 17.05; SD = 8.70); athpel (M = 13.58; SD = 7.67); table (M = 15.80; SD = 8.41); and ghat (M = 10.00; SD = 6.26) worker groups. Ghat workers emerged as the least stressed group with the lowest mean value meaning, thus ghat task workers have the least stress. Overall, the diamond workers were found to have mild level of stress (M = 15.41; SD = 8.70). To test the significance of difference in the mean scores on stress obtained by the diamond workers belonging to different job task groups, one-way ANOVA was computed, as shown in [Table 2]. It is evident from the [Table 2] that the F value for the job task group was significant at 0.01 level. To compare the difference in the stress level of a job task group of workers with all other groups, Games–Howell's Post hoc test was used; findings are shown in the [Table 3]. Viewing the comparison [Table 3], stress of diamond workers across the different job task groups, a significant difference in the stress level in ghat workers and all the task group of workers were found. There was no significant difference in the level of stress among table, talia, athpel, and mathala workers. Therefore, there was no significant difference in the level of stress across different job tasks except ghat task workers. The data indicate that a mild level of stress was found among the diamond workers. This suggests that the diamond workers suffer from mild stress; it seems reasonable to infer that the diamond workers experience some emotional, physical, cognitive, and behavioral issues, including becoming easily agitated, frustrated, and moody, feeling overwhelmed, like you are losing control or need to take control, having difficulty relaxing and quieting your mind, feeling bad about self (low self-esteem), lonely, worthless, and depressed, avoiding others, low energy, headaches, upset stomach, including diarrhea, constipation, and nausea, aches, pains, and tense muscles, chest pain and rapid heartbeat, insomnia, frequent colds and infections, nervousness and shaking, ringing in the ear, cold or sweaty hands and feet, dry mouth and difficulty swallowing, clenched jaw and grinding teeth, constant worrying, racing thoughts, forgetfulness and disorganization, inability to focus, poor judgment, being pessimistic or seeing only the negative side, changes in appetite – either not eating or eating too much, procrastinating and avoiding responsibilities, increased use of alcohol, drugs, or cigarettes, exhibiting more nervous behaviors, such as nail biting, fidgeting, and pacing. The results of this study revealed that the level of stress among diamond workers are not significantly influenced by their job task, except ghat workers. Ghat workers did not report any stress. This indicates that the workers in ghat task are possibly more comfortable compare to all other job tasks. Ghat job task is now become a computer-assisted work, which may make it easier and interesting. On the basis of the observed pattern of result, it can be considered that the possible reason for the stress among the diamond workers are not visibly the type of job task. It may be speculated as the nature of work, work setting factors/environment like dust, noise, incentives, interpersonal relations, and family responsibility in inadequate income. The result of the present study indicates that the diamond workers were found to be mildly stressed, irrespective of their job tasks. Stress scores did not differ among diamond workers across the different job tasks except ghat tarasi workers. Ghat task workers did not report a significant level of stress. The mathala task workers were seen as the most stressed group whereas ghat workers were the least stressed. The diamond workers belonging to different job tasks have not obtained significantly different mean scores on stress scale in all comparison groups. The mean score found in ghat workers was significantly different from the mean scores on all other task workers. After data analysis and its interpretation, the diamond workers (who were found to have significantly higher level of stress) along with their family members have been suggested to take help of clinical psychologist/counselling psychologists/psychiatrists to overcome stress. Dutta P. What are the Important Properties and uses of Diamonds? 2012. Available from: http://www.preservearticles.com/201012291917/properties-uses-of-diamonds.html. [Last retrieved on 2016 May 06]. Caspi A. Modern diamond cutting and polishing. Gems Gemol 1997;33:102-21. Patakh HN. Case of The Diamond Cutting and Polishing Industry, Paper Presented in National Seminar on Social Security for the Unorganized Labour, Organized by MGLI; 21-22 July, 1989. Mehta H, Ribadiya G. Morbidity task and treatment pattern among the workers of diamond cutting and polishing industry at Ahmedabad city. Indian J Pract 2008;5:11-2. Dave SS, Copas A, Richens J, White RG, Kosambiya JK, Desai VK, et al. HIV and STI prevalence and determinants among male migrant workers in India. PLoS One 2012;7:e43576. Bharadva NA, Gamit CL, Mansuri BM, Chaudhari VP, Kantharia SL. Prevalence of various forms of tobacco use and factors related with it in diamond cutting and polishing workers of Surat city, India. Int J Interdiscip Multidiscip Stud 2014;1:27-32. Gheysens B, Auwerx J, Van den Eeckhout A, Demedts M. Cobalt-induced bronchial asthma in diamond polishers. Chest 1985;88:740-4. Crawford JR, Henry JD. The depression anxiety stress scales (DASS): Normative data and latent structure in a large non-clinical sample. Br J Clin Psychol 2003;42:111-31. Lovibond PF, Lovibond SH. The structure of negative emotional states: Comparison of the Depression Anxiety Stress Scales (DASS) with the beck depression and anxiety inventories. Behav Res Ther 1995a; 33:335-43. Lovibond SH, Lovibond PF. Manual for the Depression Anxiety Stress Scales. 2nd ed. Sydney: Psychology Foundation; 1995b. Akin A, Cetin B. The Depression Anxiety and Stress Scale (DASS): The study of validity and reliability. Educ Sci Theory Pract 2007;7:260-8. Karriem-Norwood V. Stress Symptoms: Effects of Stress on the Body; 2015. Available from: http://www.webmd.com/balance/stress-management/stress-symptoms-effects_of-stress-on-the-body?page=2. [Last retrieved on 2016 May 06].